The Byron Bay and Northern Rivers region of New South Wales is renowned for its spectacular coastline and bustling tourism, but head inland from the beaches and you'll find some of the most lush and fertile farmlands in the country. The Byron Bay region is full of passionate farmers and producers who make and grow a diverse range of world-class products and ingredients; from macadamia nuts, fruit and vegetables to artisan dairy and top quality meats. This abundance of fine produce supports a thriving food culture in the region. Here are just a few of our favourite Byron Bay restaurants and cafés within the Northern Rivers area. 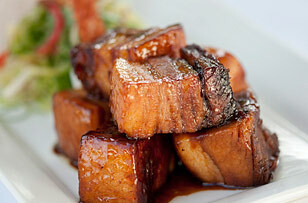 We think the best Thai food in Byron Bay is Traditional Thai. Our favourite dishes at this casual restaurant are their duck spring rolls and their delicious crunchy, moist pork hock with sticky chilli glaze – yum! 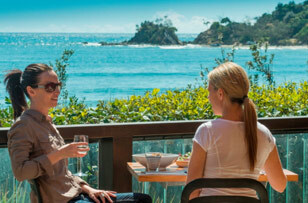 The Byron Beach Café is perfectly situated on Clarkes Beach, at the eastern end of main beach. It's the closest restaurant to the water and we often suggest it for lunch as the view by day is stunning. You may even see whales from your table during the migration season! Bayleaf café is in Marvell Street and serves locally-roasted Marvell Street Coffee Roasters. Open for early morning coffees from 6.30am, the baristas will not let you down! Breakfast or brunch is good here too, serving local produce with an interesting selection of healthy dishes. 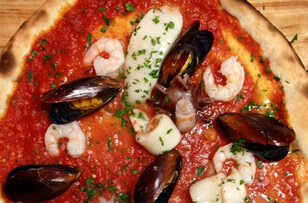 Il Buco is a small and casual pizza restaurant tucked away in Bay Lane in the centre of town. It's quite new and they're making some great pizzas using lots of local produce. 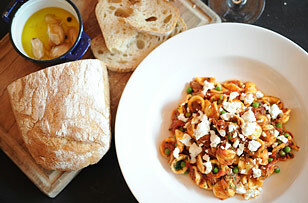 Il Buco is great for a casual and inexpensive night out. 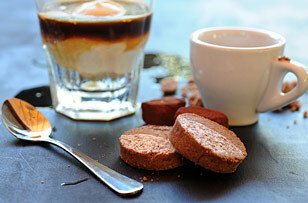 Make sure you try one of their luscious desserts like their home-made tiramisu. It's BYO too! Belongil Bistro is at the Belongil Beach end of Byron Bay. It's open for breakfast and lunch and is the closest eatery to Cavvanbah Beach House, just a few minutes walk along the beach. It has great value dining with a good selection of menu items. If the gnocchi is on the menu, be sure to try it! Top Shop have pastries to die for, freshly baked each day in their kitchen. The croissants and danish pastries are not to be missed. 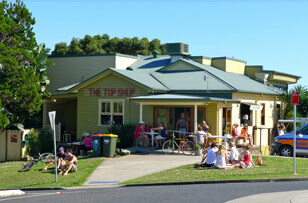 After a mid-morning surf, try a Top Shop burger for a late lunch while relaxing on their front lawn in the sun. Hidden down a narrow alleyway in the centre of Mullumbimby – about 15 minutes north of Byron Bay – is Rock & Roll Café. While the café is relaxed and casual, this hidden gem serves up some of the best Thai food we've ever eaten! They serve breakfast and lunch 7 days, and dinner from Wednesday to Friday. Also in Mullumbimby is Milk & Honey with its wood-fire oven, turning out some of the best wood-fired pizza ever! Their pizzas have crisp, home-made sourdough bases topped with interesting combinations of local produce from the Byron Bay and Mullumbimby Farmer's Markets. They're matched perfectly with a great selection of tasty salads. 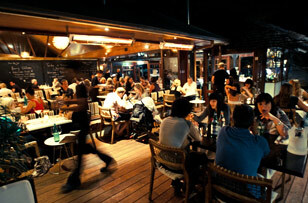 St. Elmo is one of our favourite restaurants in Byron Bay and is our number one choice for a really nice night out. St. Elmo is friendly and relaxed, yet a very smart and professional operation. Tom and Angela are the owners and they're serving some excellent, fresh and interesting Spanish tapas. They also have a great wine list and full cocktail bar. Lots of our guests dine here and have thoroughly enjoyed their experience. Bookings are recommended at St. Elmo. The Italian is also one of our favourites for a more sophisticated dining experience in town. It's ideally located right on the main beach next to the Beach Hotel. The Italian is a professional operation and provides a great night out in a very comfortable and stylish environment. Bookings are recommended at The Italian. If you'd like to drive somewhere really nice for dinner, we highly recommend Harvest! It's 20 minutes out of town, on the edge of the hinterland in the little village of Newrybar. Harvest is a fantastic place to eat – a real find, but you do need to go by car. They're also open for lunch.